The Carr Lane Roemheld DropZero modular zero-point clamping system enables users to completely machine a workpiece in one setup, significantly reducing setup time and fixturing costs. With a few turns of a wrench, DropZero locates, supports, and securely clamps the workpiece from underneath, providing full machining access to five sides. 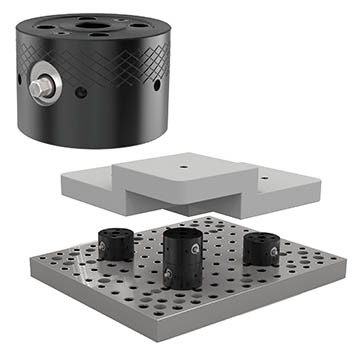 Pull studs (round, diamond, and floating) are mounted directly to a part, and clamping modules can be mounted anywhere on the fixturing plate, elevating the workpiece for machine-spindle clearance. Clamp modules are stackable for added clearance and can fit on all of Carr Lane Mfg.’s 1/2″ and 5/8″ modular tooling plates and blocks. They can also be used with non-modular tooling.